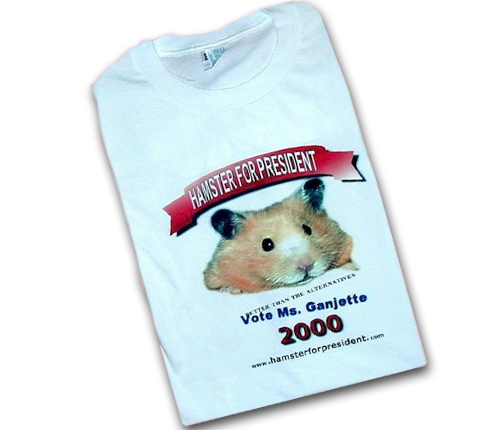 The honorable Miss Ganjette, the daughter of Mister Ganja, was born 30 April 1998, shortly before the death of her beloved father, the first Hamster For President candidate. 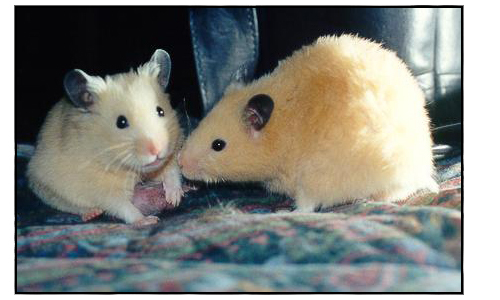 She choose to follow in his footsteps and announced late that summer that she would become the second Hamster For President candidate. She chose her husband, Scratch, to be her running mate. Scratch came into the world under circumstances that suggested greatness, even before he drew his first breath. 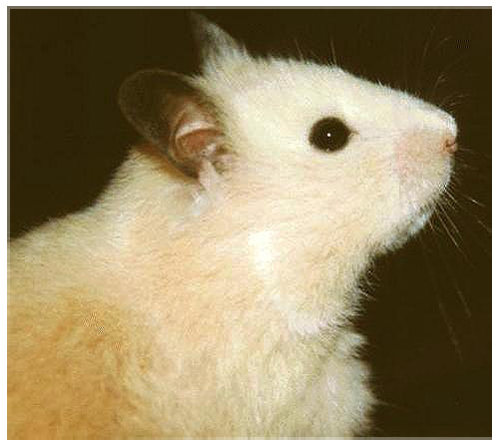 His great grandfather -- the legendary superhamster, Sherman -- had achieved fame as one of the most intelligent and remarkable hamsters ever to live. In his old age, Sherman was revered and pampered. Though he suffered from arthritis in his last months, he stood staunchly with the campaign, appreciating the abundance of attention and love he received. Thus, it was a painful blow when this most esteemed creature and family member passed away in the early hours of the 7th of April, 1998. But life was to go on, for that very day Sherman's granddaughter Sylvie was expected to give birth. 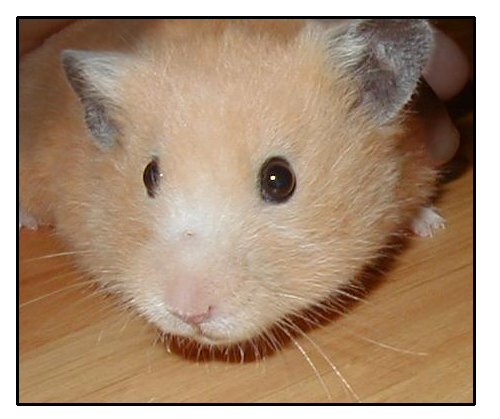 Twelve tiny, wiggly, red hamster babies were born to her that night. And as they grew up, one stood out from the rest. Unlike either his mother or his father, and unlike any of his eleven siblings, he had the tan coloring of ancestor Sherman, and we knew without question that he had been sent to take Sherman's place. He was Scratch, and he lived up to his heritage in every way. In the fall of 1998, Scratch and Miss Ganjette were married. 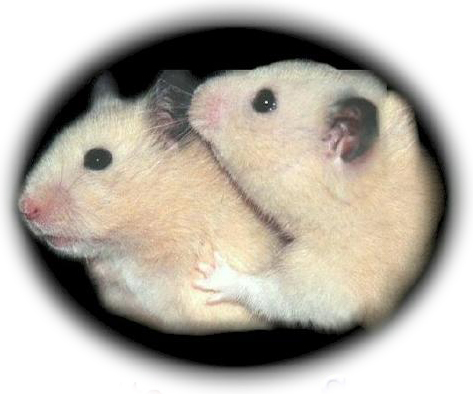 The couple produced three litters of babies, a total of 23 children, all of them surviving to adulthood. 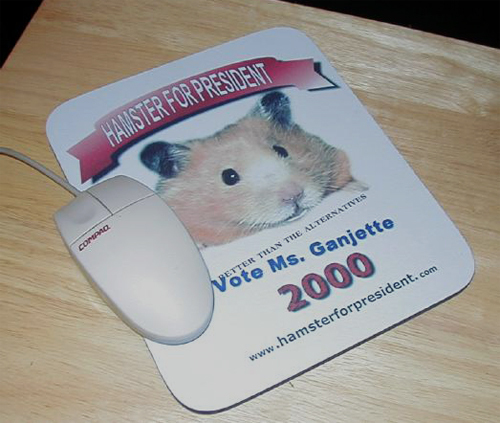 Miss Ganjette's campaign continued to attract attention nationwide and ultimately, at Scratch's urging, she registered the domain HamsterForPresident.com. Her face was featured on a campaign teeshirt was spotted on fans as far away as London and Nairobi. 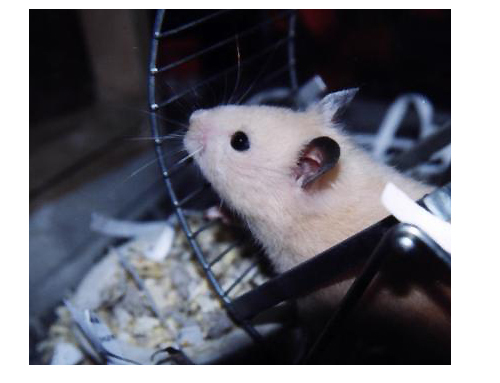 The life of the second Hamster For President candidate was peaceful and entirely dignified with the exception of one incident in her youth when she got out of her cage and was retrieved from under a stove with soot on her brow. She managed to live it down and age gracefully and beautifully. Finally, on the 25th of February in the year 2000, Miss Ganjette died peacefully in her sleep. It was a month before the birth of two great-great grandsons who would live to become even more famous than she was. On that day, her grieving spouse stepped down from the vice-presisdential slot leaving it open to the next generation. Scratch had extraordinary intelligence, and even after the passing of his lovely wife when he abandoned the vice-presidency, he remained alert and strong. Indeed, Scratch had a dazzling personality and physical stamina to match. 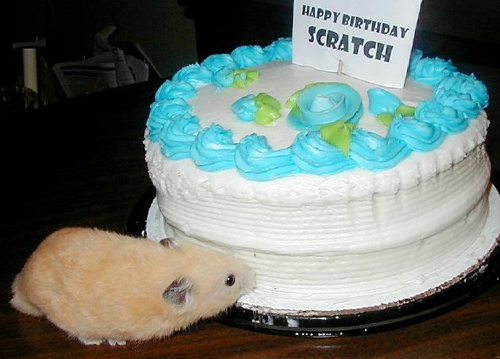 Even when he celebrated his 28th (month) birthday -- with a large supermarket birthday cake purchased for the occasion -- he looked the way one would expect of a hamster half his age. 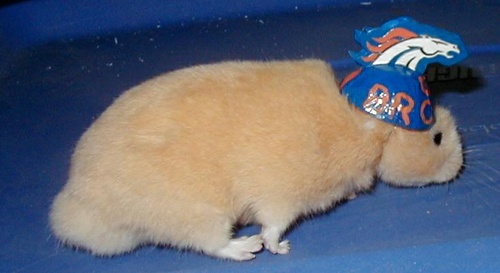 Scratch, a football fanatic, was given a gift he highly prized - a Denver Broncos football helmet made of a walnut - which he wore gracefully and gratefully during games. It fit loosely with the neck band nestled in his fur. 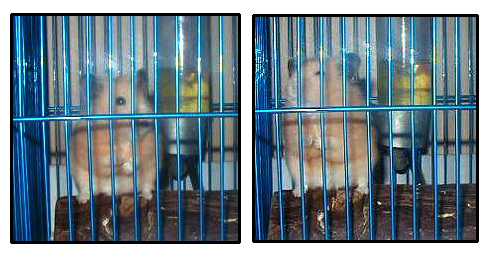 He continued to age with dignity, though in his last weeks he slept more and more and gradually lost weight. His death came at 3:40 in the morning on the 789th day of his long, illustrious life. After a couple of days of not eating, he finally passed away, cradled in the hands of one who had loved him his entire life - and remembered forever. When Scratch passed away, three younger generations survived him. 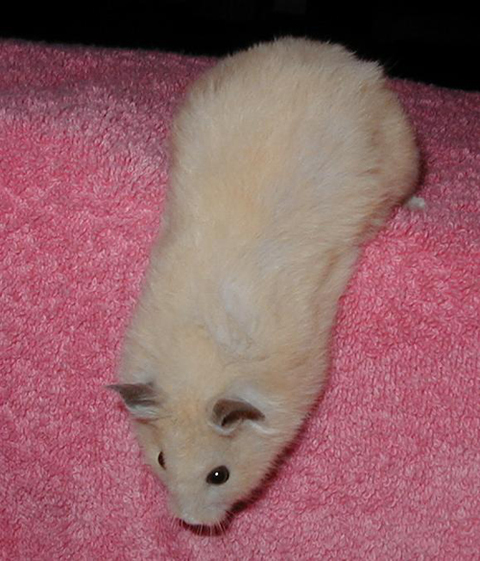 The daughter of Ganjette and Scratch, Balu (married to Simon the Sweater-Eater), had given birth to a son, Booker T. Hamster, the couple's grandson. "Bookie," as he was called, married Yako Zimba and had a daughter, Jade, the great-granddaughter of Miss Ganjette and Scratch. 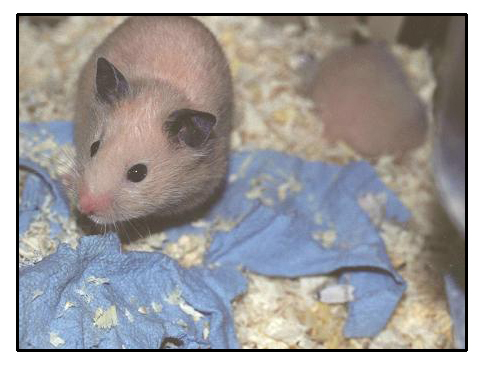 On the 24th of March 2000, Jade (married to Yarash) gave birth to a litter that included two sons destined to carry the Hamster For President campaign to unprecedented heights.